Pakistan Tehrek-e-Insaaf demonstrate his huge political power yesterday in Multan Rally. The local PTI management choose Qasim Bagh for PTI Rally but they not know the exact number of peoples who can come o join PTI Rally. Due to huge peoples gathering in small area many of PTI workers conditions went to abnormal. The reason is the hot weather and no availability of water in rally place. During the speech of PTI Senior member Shah Mehmood Qureshi the PTI Workers and the DJ of PTI Music handler informed the senior PTI leadership about the bad condition of PTI Workers, DJ also announced to the management they should send the water and ambulances because peoples getting faint due to Fug but Shah Mehmood Qureshi and other PTI responsible not took an eye on this issue and continued their speeches. After the speech of Imran Khan the huge crowed try to leave the rally place and they moved towards the main gate of Qasim Bagh for leaving but due to huge crowd many of peoples stucked into stampede and the result total of 7 peoples dead and dozens injured. Imran Khan held DCO Multan, Zahid Saleem Gondal responsible for the deaths while PTI Central Vice President Shah Mehmood Qureshi also blamed the DCO. Qureshi alleged that the Multan administration and police did not cooperate with PTI for the rally, adding that only two gates were opened for people leaving the venue. Qureshi further added, that the incident was a result of mismanagement by the Multan administration. DCO Multan while speaking to a News channel said he has a written agreement which states that PTI will be responsible for all matters inside the venue and his teams will manage the area outside. The DCO also said, had it not been for his teams vigilance the death toll could have been ten times higher. Geo News and others media channels reported that the bad condition of PTI workers have been started during the Shah Mehmood Qureshi speech and the PTI workers informs to the senior PTI members in front of media cameras but no action took place at the spot. 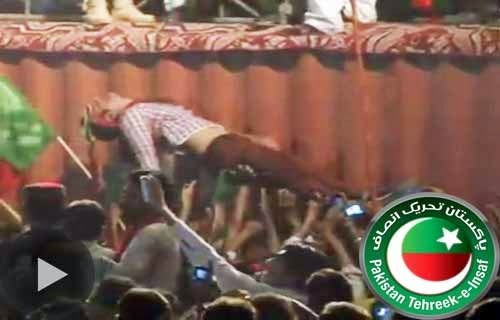 Watch the below video which reveals the truth of PTI rally Multan incident.